3 Änderungen dieser Version sind noch nicht markiert. Die gesichtete Version wurde am 26. Juli 2011 markiert. (Original engl. : "Christian faith is a grand cathedral, with divinely pictured windows. Standing without, you see no glory, nor can possibly imagine any; standing within, every ray of light reveals a harmony of unspeakable splendors." - The Marble Faun. Kapitel 33 Pictured Windows. (Original engl. : "It is a great mistake to try to put our best thoughts into human language. When we ascend into the higher regions of emotion and spiritual enjoyment, they are only expressible by such grand hieroglyphics as these around us." - The Marble Faun. Kapitel 28 The Owl Tower. (Original engl. : " It was a glimpse far backward into Arcadian life, or, further still, into the Golden Age, before mankind was burdened with sin and sorrow, and before pleasure had been darkened with those shadows that bring it into high relief, and make it happiness." - The Marble Faun. Kapitel 9 The Faun and Nymph. (Original engl. : "As these busts in the block of marble," thought Miriam, "so does our individual fate exist in the limestone of time. We fancy that we carve it out; but its ultimate shape is prior to all our action." - The Marble Faun. Kapitel 13 A Sculptor's Studio. (Original engl. : "At least, she might conclude that sin - which man chose instead of good - has been so beneficently handled by omniscience and omnipotence, that, whereas our dark enemy sought to destroy us by it, it has really become an instrument most effective in the education of intellect and soul." - The Marble Faun. Kapitel 47 The Peasant and Contadina Sculptor's Studio. (Original engl. : "Let men tremble to win the hand of woman, unless they win along with it the utmost passion of her heart!" - The Scarlet Letter. 1850. Kapitel XV Hester and Pearl. Commons führt Medien zu Nathaniel Hawthorne. 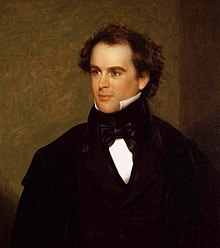 Wikisource führt Texte oder Textnachweise von Nathaniel Hawthorne. Diese Seite wurde zuletzt am 7. Januar 2017 um 11:43 Uhr bearbeitet.